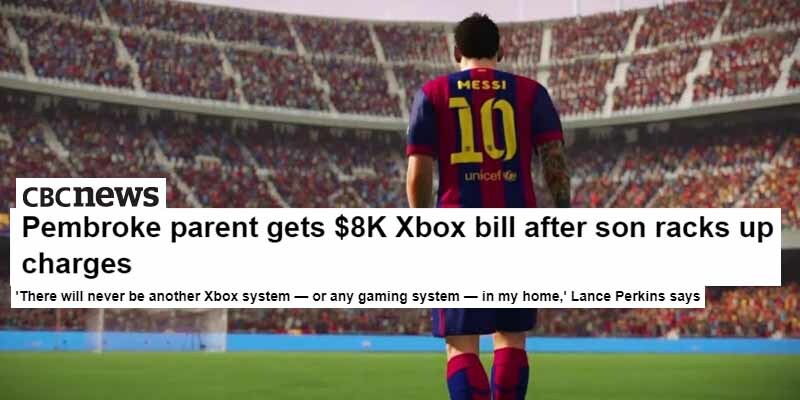 Lance Perkins from Pembroke, Ontario, Canada gave his 17-year-old son a credit card to be used for emergencies only, but Perkins Jr. defined “emergency” as needing more virtual cash in FIFA 16. When Perkins got the bill, it was for almost $8000 Canadian dollars. That’s around $5300 USD, a spending spree that his son claimed was an accident. He meant to buy just the game — he hadn’t know that he was buying virtual money with real money. Seems legit. Perkins’ credit card company said the purchases would stand unless he wanted to charge his son with fraud. Microsoft gave a similar reaction, telling Perkins that he should’ve set the parental controls before giving the teen a credit card. ‘There will never be another Xbox system — or any gaming system — in my home,’ said Perkins.